We first meet Daphne in the orphanage that she has been consigned to since the death of her parents in the car crash that also left her unable to speak. She clearly loves all sorts of animals – she finds some field mice and her immediate thought is that they are really sweet and she wonders if she could tame them as pets. She herself is pretty wild though – when the cook finds the mice and is about to splifficate them, Daphne’s resort is to attack and bite the poor woman. Well, she can’t argue rationally with anyone, but additionally everyone in the orphanage seems to have written Daphne off as a daftie who has strange ideas and is not to be trusted. Nor does anyone in the orphanage empathise with her in other ways. Even when she writes it down as a heartfelt plea, she is not allowed to miss the road journey to the farm that is proposed as a holiday trip – even though such a journey is bound to bring back memories of the day her parents were killed. At the farm however she makes friends with a wild horse. Unfortunately this is a horse that everyone has been told to keep away from, as it’s ‘best left alone’ – rather like Daphne herself, I suppose. Again and again the misunderstanding by the authorities who are looking after this girl are clearly signalled – she is still shocked after the journey but the matron thinks she is avoiding doing her share, or mooning about. And the matron doesn’t really do her job properly in other ways – in telling the other girls not to go near the wild horse she doesn’t check that Daphne had heard or understood, which could have been a fatal error. She also asks her daughter Eileen, arrived to share the holiday, to befriend Daphne – and Eileen clearly shares her mother’s lack of tact, talking loudly to Daphne as if she was stupid rather than simply unable to speak. The matron continues in this vein, taking Daphne into town by car despite her clear fear of this mode of travel; Daphne rebels and walks back by herself, but this backfires when she gets lost in the moorland with night coming on. The white horse that everyone else was warned about comes to comfort and help her, and she is charmed and delighted by the mare rather than being frightened (because she didn’t hear or listen to the earlier warning). Daphne is led back to the farm by the horse and manages to make more time to spend together after that – each lonely creature being the other’s only friend. Of course it doesn’t take long for the other kids to find out – they throw stones at the horse they believe to be dangerous, and of course Daphne can’t speak to tell them that she is friends with the mare. 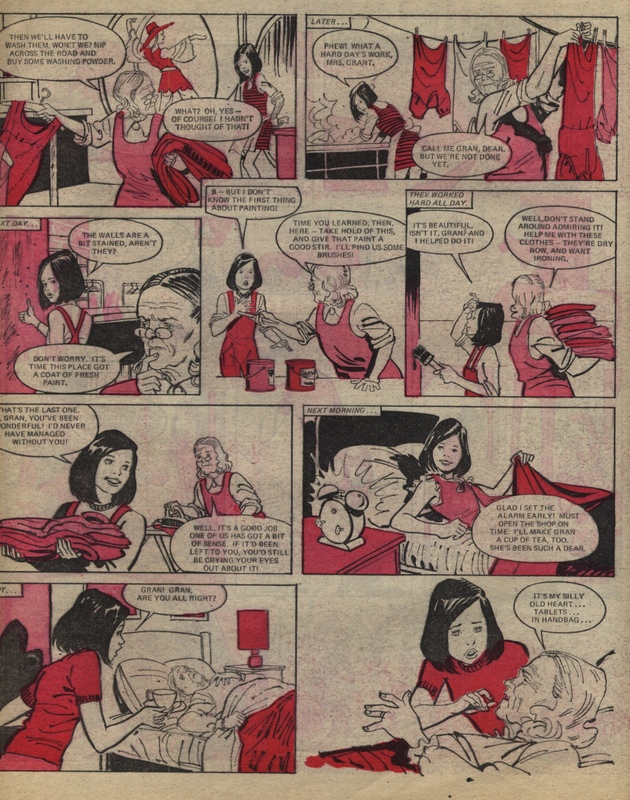 The matron is fed up of Daphne sneaking off and assigns her daughter Eileen to make friends with the girl and to keep an eye on her – not that Daphne is fooled. Especially as Eileen thinks she is so clever, training to be a nurse and having an interesting case to study right in front of her! Daphne rebels, cheekily writing in Eileen’s set of notes that she needs to take ‘more care … over simple spelling.. very untidy writing…’. After initial crossness, Eileen laughs heartily and takes Daphne more seriously, opening up the possibility of real friendship between the two – but of course Daphne still has the secret of the horse to keep. It’s not a secret for ever – Eileen finds the bridle that Daphne has been using to ride the mare, and has a dilemma of her own. If she gives away the secret then she knows Daphne will never forgive her, and if she doesn’t, then she’s afraid the white mare may turn dangerous and even kill Daphne one day. What should she do? The secret is clearly not going to last for long. Eileen tells Daphne her fears, which is at least rather more grown-up than just telling the authorities – and the warning seems to be borne out when the mare throws Daphne for no very obvious reason. Is the horse turning wild and unsteady again? The story of the horse and the girl are clear parallels – the reason the horse seemed wild and unreliable was because of the bad experiences she had that led her to grow wild in the first place. Daphne’s hair style had reminded the horse of that time, which is why she was thrown. But the two couldn’t stay away from each other for long. When they next met they rode together for joy – into dangerous bog! Daphne is saved by the mare’s actions and wants to save her in turn – which means revealing the secret. Unfortunately, it is to the last person in the area who will take it well – she has to tell Jem, the farmhand who bears the most of a grudge against the mare, from when she broke his arm in a frenzy. He thinks the mare is dangerous and vicious, and is more likely to kill her than save her! Because Daphne is willing to go into the bog after the horse, and drown alongside the mare if need be, Jed is forced to save the horse – but takes his gun out later to kill her after all, now he knows where she is. Of course Daphne can’t leave it like that, so she sneaks out after midnight to save the mare, which she does by hiding her in an abandoned mine – little knowing that this is just another danger. This time it is a danger for Daphne herself, who falls down a hole and cannot even scream to let people know she is there. The mare knows, but how can she bring help? Only by exposing herself to danger, which she does – she brings the farmer and Eileen to rescue Daphne. 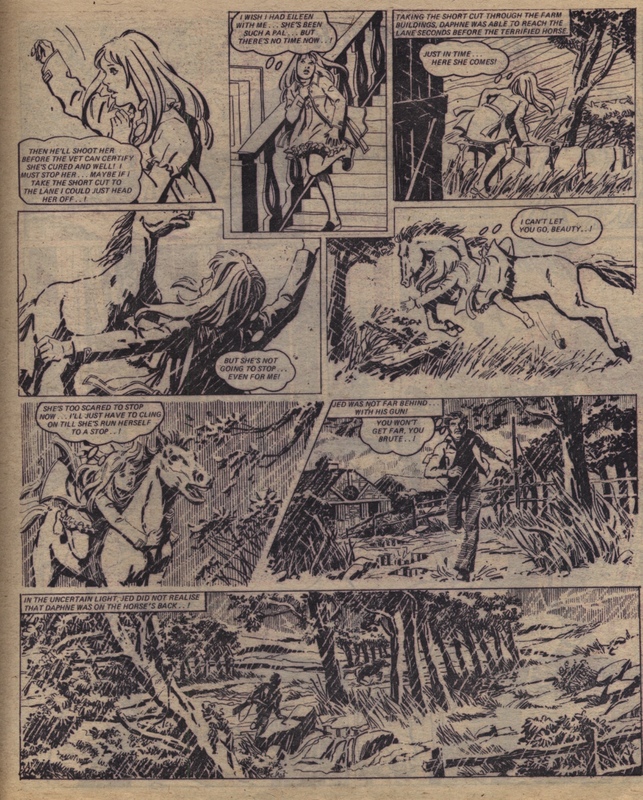 Many people in the farm now realise the horse is not dangerous after all, and are willing to rehabilitate it – but not Jed (as can be seen in the penultimate episode above). He drives the horse away and shoots at it, to make it seem as if the horse went wild again and needed a mercy-killing – but Daphne gets in the way and is shot instead. The unknown artist (who also worked on “Gwen’s Stolen Glory”) does a lovely job once again. 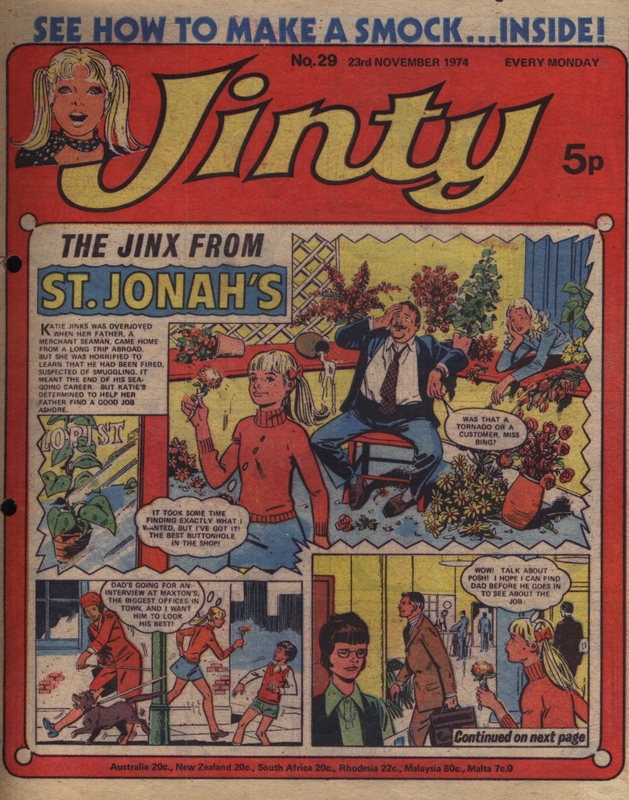 These were the only two Jinty stories that s/he drew: if anyone knows of any stories by this artist in other story papers, please do let me know. Many of the episodes are very clear and open in feel, with a lot of white space used for hair and other details that might well be completed in darker textures by other artists. This artist reserves that for scenes like the one in the sample pages – taking place by night, and with potentially deadly outcomes. It makes for a story drawn with a lot of nuance and variety. The writer is also unknown. 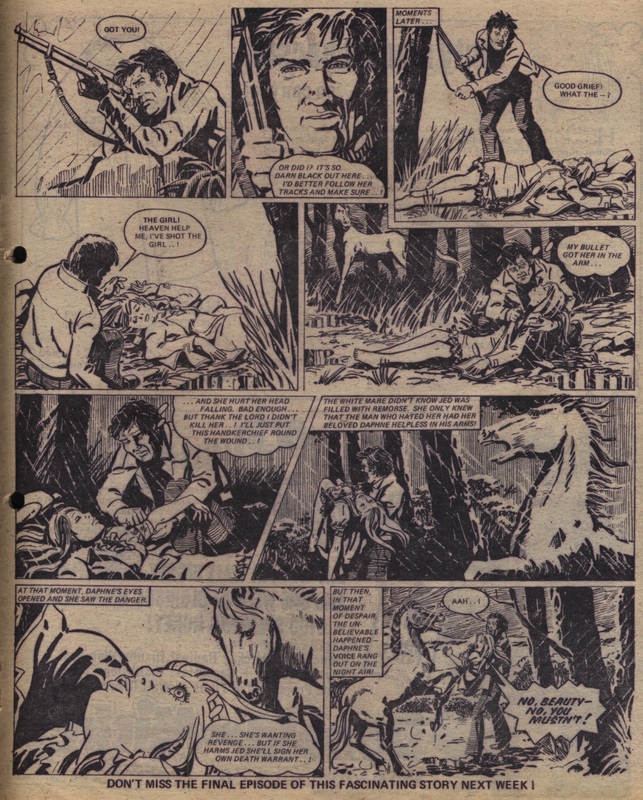 We understand that often the same writer and artist were paired up repeatedly, and Alan Davidson is known to have written “Gwen’s Stolen Glory” – could he therefore have written this story too? Hopefully his wife Pat would be able to confirm or deny this at some point, but against this suggestion we should set the point that “Jackie’s Two Lives” ran at the same time as this story. It was not unknown for writers to have two or even more stories running at the same time, but nor was it that usual. 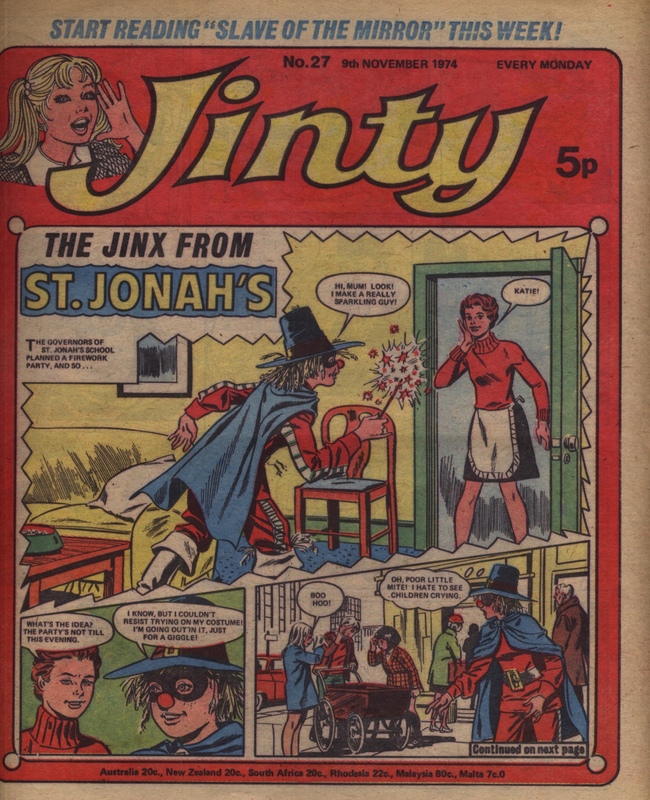 Pat Mills is also known to have written at least one horse story in Jinty, and he has declined to specify which one (giving the impression that he was a bit unimpressed in retrospect with that particular story). 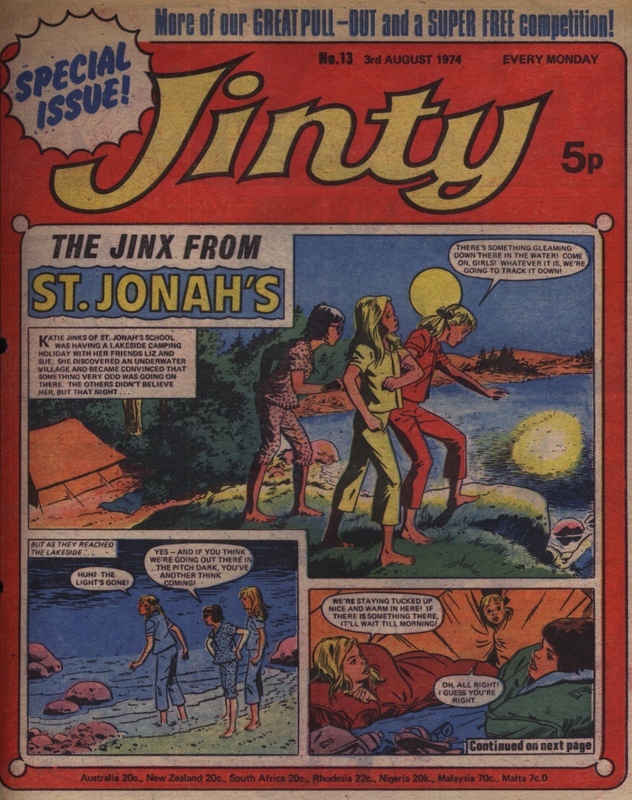 This is actually a rather good story – tight and dramatic, if more low-key than some other Jinty stories with supernatural goings-on or scenery-chewing villains. 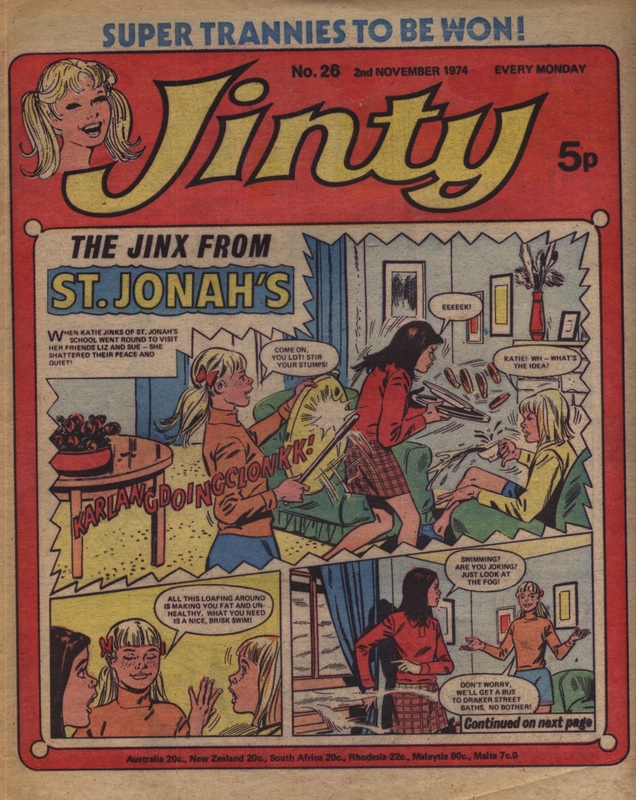 It’s not the sort of thing that I would expect Pat Mills to have any particular reason to disown – the protagonist is hard-done-by by the authorities and has to make her own way in life. She takes no guff, and this is not a particularly daft story or over-the-top in any way. It could still be the missing Mills horse story, but I take leave to doubt it. 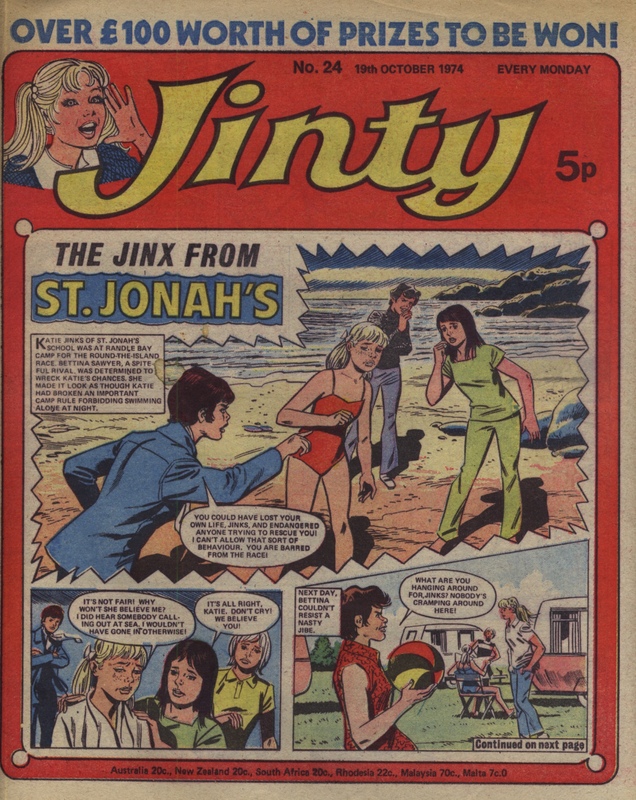 The surprisingly-serious Jinx story ends with a pratfall, returning to its normal style. Jealous rival Bettina has been unmasked and Katie has been crowned swimming champ – before crowning others with the cup as she falls over! 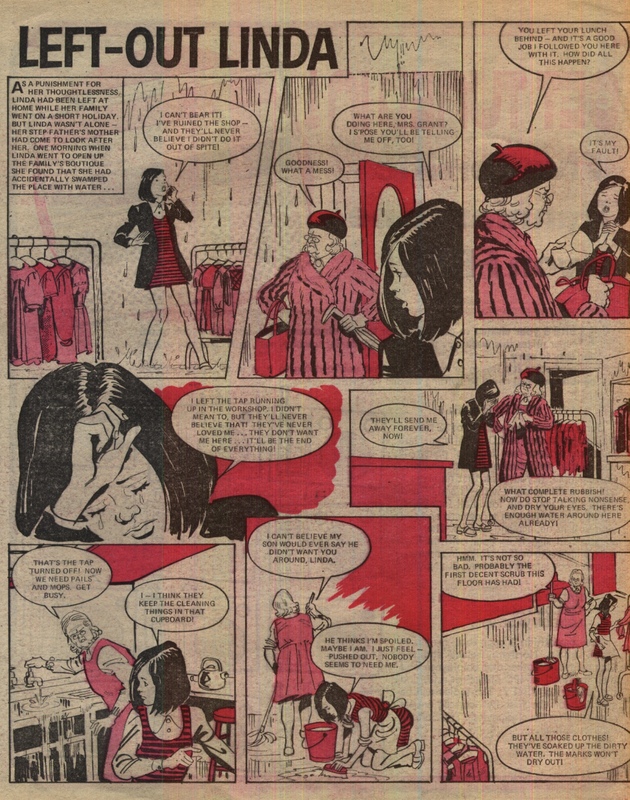 In “Left-Out Linda”, the writer ups the ante – Linda’s new stepfather is so angry with her that he slaps her, saying that’s what she would have got sooner if he’d been her father all along! Quite rightly, the mother kicks the new husband out as a result. Also understandably, the mother is pretty cut-up about her new relationship going to the dogs and is not exactly happy with Linda either. Not a bad message all round really, though as the mother and step-father do end up back together again in the end, the domestic violence message is perhaps somewhat diluted subsequently.